Come see me speak about transit-oriented development on Thursday, May 9, at 7pm! At Dominican University! Okay, so my subject, “Marin Traditions and Models for Transit-Oriented Communities,” might not stir excitement in your heart, though it may if you’re a regular reader at TGM. Still, you should come. 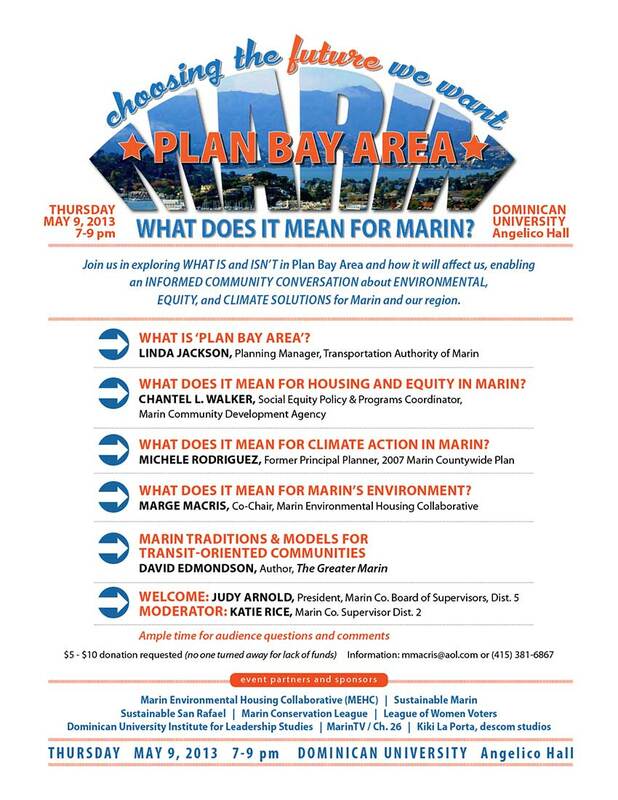 You’ll get to hear from experts from around Marin on what Plan Bay Area could mean for Marin, and how our county can approach that future without sacrificing our independence or character. Still not interested? Then come for the Q&A panel discussion afterwards. We on the panel don’t agree on everything, so you’ll get a diversity of views on how Marin can approach the future in a positive way. Still not interested? Then come to chat with me afterwards. I suspect that you may be able to sucker me into a post-panel beer. Can’t come? The whole thing will be on MarinTV, Channel 26, though at a later date. Was wonderful to finally meet you , Dave. I enjoyed your presentation.